Today marks the release of another Craft & Vision series photography e-book and I have to say this is a fantastic release. Making Light is all about using off-camera flash. If you’ve ever shot photos with the pop-up flash on your dSLR you know how harsh and unflattering that light can be. Taking the flash off-camera opens up a whole new world. I remember when I first started shooting with small off-camera flashes I was so excited to start experimenting. It really took my photography to a whole new level. So I was really excited to see this e-book as I’m always looking for tips and tricks and new things to try. As a photographer the learning process never stops. The book starts out with the basics, defining light and it’s characteristics such as size and quality, color and direction. The author then sucker punches you with some math formulas. Hey, this is photography! What’s up with the math? But really it’s not so much about the math and more about the general law or principle. It’s not important to know the exact formula but it is important to know about things like the angle of incidence or the inverse square law so that you can apply it to your photography. The author does a great job of describing those laws and then showing how to apply them in every day shooting situations with real examples. It’s really good stuff! After the introduction into theory the author digs into what every photographer loves to talk for hours about: gear. What are the requirements for getting started with off-camera lighting? You’ll get the details in this book. While the author noticeably shoots Nikon he does a great job of also talking in depth about Canon gear as well as non-brand gear that can save you literally hundreds of dollars. From flashes to cables to wireless “triggers” to modifiers like umbrellas and softboxes the author really spends a lot of time discussing the pros and cons of the various pieces of equipment tempting you. He shows his scaled down travel kit as a reminder that you don’t always need every piece of gear to get the job done. Sometimes less is more. My own kit includes two Canon flashes, the Canon 580EXII and the Canon 430EXII. For wireless triggers I use the Cactus v4’s which can be found on Gadget Affinity. I have had great success with these triggers and they are really inexpensive. I see that they have the Cactus V5’s out now as well. There is a section on setting up various Nikon and Canon cameras to shoot off-camera flash going through the menu of each in detail. For those shooting with those particular models it may be a valuable resource. Another valuable resource was the authors fail-safe 10-step approach to shooting photos with off-camera flash. Finally the author presents 9 case studies in detail with information on how he set the shot up, where his flash was placed (all 9 examples used a single flash) and his reasoning for setting it up in that manner. For me this was the most valuable section as I have been shooting off-camera flash for some time now but I have been wanting to see examples of how others setup their shots and why they set them up that way. If you’ve been curious about how some of these amazing shots are created this section will rock your world. There is a lot of information on off-camera flash in this book and if you are just getting started in the world of off-camera flash or if you’ve been experimenting for a while with it this book will offer up some great tips and tricks for taking your photography to a whole new level. The author has also really set the stage for a follow-up book on this same topic with even more detailed information so if you think this is the end all book on off-camera flash think again. 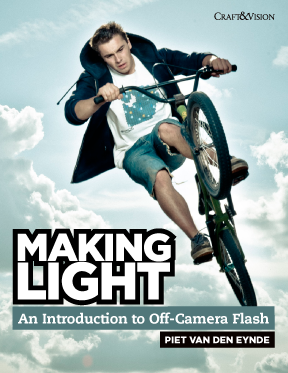 But if you’re looking to start experimenting with off-camera flash then this is a book you won’t want to miss. And for $5 how can you really go wrong. Making Light was written by Piet Van Den Eynde and is part of the Craft & Vision series produced by one of my favorite photographers David DuChemin. You can pick it up until August 21st for $4 by using code LIGHT4 on checkout. If you purchase more than 5 ebooks use code LIGHT20 to get 20% off your order.